The Dunlop Straplok System is designed with the artist in mind. 360 groove-and-ball design allows the unit to rotate without catching. The strap retainers are easy to install and operate. The case-hardened steel skin guarantees long life. The same strap can be used with several guitars as the strap button is interchangeable. Release-tested up to 800 lbs. of pull; it won't come loose. 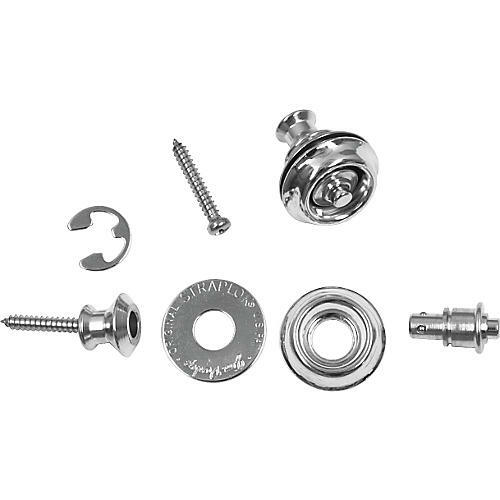 Complete set (2 units for instrument and strap) adapts to instrument by replacing existing strap pins and screws with special Straplok System brand buttons and screws. 2 strap attachments are included. Put it in the cart or give us a shout.